Given that our previous experiences had been entirely favourable, it was without too much trepidation that I suggested to Steve that we should book for the Branch Line Society's "Tame and Avon" tour of 5 March 1988. I should have been forewarned by the date advertised, Saturday 6 March. Was it to run on Saturday 5th, or Sunday 6th? The itinerary was to be an extensive tour of "rare curves" (!) and freight only lines in the West Midlands, running from Birmingham New Street. Our train, standing at Platform 12, consisted of the GWR liveried Pressed Steel class 117 3-car sub urban unit. It was well filled when we got on, and we had to take seats in the leading power car, 51410. To add to the potential discomfort, fumes apparently from the heater added to the "atmosphere". Our first destination was to be New Street! - via Lifford; out on the Camp Hill line, returning via Selly Oak to platform 8, where we picked up one or two late arrivals. Sprinter 155 321 stood ticking over nearby. Our next destination was Stratford, along the main line to Hatton, then via North & West junctions onto the single track to Bearley, and down the bank to Stratford station. At Hatton North junction we came to a stand. The signal showed green, but no "feather" for the branch. A quick phone call by the driver soon rectified the situation. At Stratford we paused briefly, before departing towards Cheltenham! We did not get very far - the buffer stops ended our trip just a couple of hundred yards further on. More rare mileage for the track bashers! We headed back for Birmingham on the North Warwicks line, along the threatened Bearley - Henley-in-Arden route. A visit to Tyseley had been arranged, our train arriving at the museum's own platforms via the through goods lines round the back of the DMU depot, where lines of Modernisation Plan units stood in a blue haze of exhaust, along with one solitary Sprinter, looking rather out of place. 27 059 and D335 stood at the back of the BR depot, while most of Birmingham Railway Museum's residents were available for inspection more closely to hand. Clun Castle and Defiant were in the shed, keeping company with Kolhapur and a Leamington horse tram. Outside were various other locomotives, from the sublime (W&L "The Earl") to the ridiculous (the steam-outline Baguley 0-4-0 petrol loco no. 800 of 1920). Alas for Mr P! "Travelling light today" he had remarked when I met him. "I'll get a hot pasty or something at Tyseley." Unfortunately the staff at the snack bar had been told we would not be requiring hot food, so he had to make do with a packet of crisps. ("Grumble grumble grumble"). We left Tyseley for the short run to Snow Hill, passing en route 47 490 and a rake of MkIIs on an Aston Villa - Bournemouth football excursion. Apparently this would be the first railtour to visit (as opposed terminate at) the new station. After a brief pause for photos, we returned to Tyseley goods loop in order to reverse via Saltley to Burton-on-Trent. At Water Orton, instead of the direct line, we took the Nuneaton line to Whitacre, then turned left on the freight - only route to Kingsbury where we rejoined the Burton line. One solitary industrial diesel stood in Cohen's yard, with many BR hopper wagons on the sidings for Baddesley colliery. We stopped at Burton to allow two southbound HSTs to pass, before retracing our steps to Park Lane junction, where we gained the scenically pleasant Sutton Park line, following this route through Walsall and on to Stourbridge. At Dudley we passed the closed Freightliner depot, then further down the line a large number of industrial locos at Round Oak, the former fleet of the steelworks. Judging from their position and livery, only two now see use at what is now a steel terminal. Eleven locomotives, all Yorkshire Engine Co 0-4-0 diesel electrics, are listed as being on site in the current Industrial Railway Society's handbook. 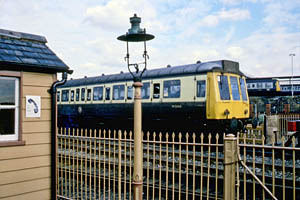 At Stourbridge, we halted alongside a another 3-car suburban unit, while the "shuttle" from Town arrived in the shape of single unit 55033, in Midrail livery. For a short while therefore, 3 very similar trains in very different liveries presented an interesting opportunity for photographers. We had in fact been photographed several times ourselves on the stretch from Walsall. Another retracing of steps took us to Bescot, where we paused briefly between the station and the depot, before heading for Wolverhampton and on to Stafford. En route we passed the Four Ashes works of Synthetic Chemicals Ltd, where to our surprise their fireless steam loco, Barclay 1944 of 1927 was in steam. On reversing at Stafford and retracing our steps it had moved down the yard, though both times we passed it was stationary, merely oozing steam. Instead of passing through Wolverhampton station we now took the "by-pass" from Bushbury to Portobello junction, and hence back to Walsall. The next stage was the threatened line to Rugeley, at risk apparently due to a particularly weak bridge. The weather was by now becoming rather dull, nevertheless a pleasant run followed across the scenic stretch over Cannock Chase. We now were to run down the Trent Valley main line to Nuneaton, though not exactly at high speed. After leaving Rugeley a couple of minutes down, we gradually lost time, being eight minutes late at Nuneaton. Here we took the route recently re-opened to passengers, to Coventry. Arrival here was eleven minutes late, and Steve began to debate whether to jump out and catch a direct train to New Street. We would have a 10 minute connection at New Street for the local to Wolverhampton and hence Shrewsbury, according to the schedule, and some serious Saturday night socialising was planned on arrival home! Our connection was due to depart New Street at 7.35. At 7.34, the signal winked to green, and we moved off, to arrive in an almost deserted New Street at 7.37. The connection had of course departed, quite properly, on time. On my previous BLS trip, I had made a minus 1 minute connection. I should have known we'd miss this one. At least it gave Mr P a chance to dispose of a large cheeseburger and reduce the rumblings from within. Our Telford and Shrewsbury train would now be the 8.20 ex Euston, so at least we had some much needed comfort. The attractions of the fume-filled crush in the DMU had begun to pale slightly after our 10 hour, 265 mile tour of the West Midlands. Overall comments? - another most interesting and enjoyable trip, with a high standard of organisation by the BLS and excellent map and descriptive booklet. Pity about the pasties!